I'm James, from UK, and have been building car kits for about 25 years now with a dry patch for about 5 or 6 years. Anyway I've renewed my subscription and although my old posts seem to have been lost?? I still have the same name - Jamese30 so I'm off again. Ironically building an airfix plane with my son at an aircraft museum was what rekindled my desire to build car kits again. So spurred on with a quite sizeable collection of unbuilt kits I have started again. Hopefully he will start to share my interest too although I'm helping him with planes at the moment. So far a Triumph TR3a, 2x Tamiya Lotus 7s (the pair bought partly started) have been finished and a 57 Black Widow Chevy, Mk1 Morris Mini and a challenging garage (im posting in dioramas) are on the workbench. Great to be back and see the awesome creations, great comments and enthusiasm! Welcome back James. Its funny how we can get those long gaps where we don't do any builds. I find planes are difficult. I agree I find airplanes to be difficult however give me that Mobb Deep baby rear smooth paint finish is just as equally if not more difficult. Thanks guys. 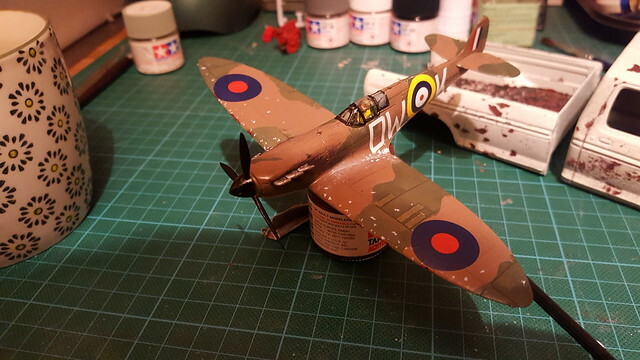 I personally find planes a bit simpler, Not to say they are at all but the ones I build tend to be 1/72, I dont beat myself up on the detail like I do with cars and I go with a "if it looks right go with it" mindset (I'm sure there is plenty a plane modeller now crying - sorry). My son loves planes too so this method works well and it grows his interest, although we are running out of ceiling space hanging them all up! I Can Only Imagine. Glad your son likes the hobby I'm still trying to get mine someone interested in it cannot wait to see your builds. Welcome back to the fold, James. Looking forward to seeing some of those builds, especially the Lotus.